These quotes from The Secret are all from the first version of the movie which included Esther Hicks speaking the words of Abraham. The Secret movie was released in March 2006, the book (of the same name) came out later that year. The Secret is all about the Law of Attraction and how you create everything that happens to you in your life with your thoughts and feelings. It explains how you can have the life of your dreams by understanding and using the principles of this universal law of nature. I think The Secret is an excellent introduction to the Law of Attraction, but it does focus more on the materialistic side of life, especially in the more well-known version with Abraham-Hicks being omitted. The basic ideas of the Law of Attraction are explained well, but to fully comprehend the vibrational reality and how to truly understand and change your life, I believe there are no better teachers than Abraham-Hicks. Everything that you bring into your experience, you bring because of this powerful law of attraction. Step one is you must ask for what you want, you do not need to use words to ask, in fact the Universe is not even hearing words from you, the Universe is responding completely to your vibration. There is another step which you must understand and it is called step three, which is the receiving step, which means you must bring yourself into alignment with what you are asking for. When you are in alignment with what you want, you feel wonderful, that's what enthusiasm is, that's what joy is, that's what appreciation is, that's what that feeling of passion is. There are only two emotions from our perspective... one feels good and one feels bad. You call them all sorts of different things, but essentially all of those negative emotions; whether you call it guilt or anger or frustration, all feel much the same, they do not feel good, and all of those are guidance saying... that which you are thinking about right now is not in line with what you are really wanting. What you are doing as you are moving through the variety of your day to day experience is you are offering thoughts that are literally formulating your future experiences and you can tell by the way you feel if the things that you are moving toward will please you when you get there. What you think and what you feel and what manifest is always a match, every single time, no exceptions. When you're looking at that thing that you want and you're saying yes to it, you're activating a thought and law of attraction is responding to that thought and bringing you things that match that. But, when you are looking at something that you do not want and you shout 'No!' at it, you're actually not pushing it away. Instead you're activating the very thought of what you do not want and now law of attraction is lining those things up for you also. You might be thinking about past, or the present or the future, but whether you are remembering, or observing or imagining, still in that process you are activating thought, and law of attraction, which is the most powerful law in the universe, is responding to your thought. You see law of attraction evidenced in your society when you see that the one who speaks most of illness, has it. When you see the one who speaks most of prosperity, has it. Law of attraction is evident everywhere around you. Your emotions, your emotional guidance system is what helps you to understand what you're thinking. Here's the problem... Most people are thinking about what they don't want, and they're wondering why it shows up over and over and over again. Most people don't understand that a thought has a frequency - every thought has a frequency. We can measure a thought, so if you're thinking about a thought over and over and over again, or if you're imagining in your mind, having that brand new car, having that money that you need, building that company, finding your soul mate, if you imagine what that looks like, your're emitting that frequency on a consistent basis. Our jobs as humans is to hold onto the thoughts of what we want, make it absolute clear in our minds what we want, and from there we start to invoke one of the greatest laws of the Universe, and that's the law of attraction. The simplest way for me to look at the law of attraction is if I think of myself as a magnet, and I know that a magnet will attract to it. We can have whatever it is that we choose, I don't care how big it is. You become what you think about most... but you also attract what you think about most. Creation is always happening, every time an individual has a thought or a prolonged colonic way of thinking, you're in the Creation Process, something is going to manifest out of those thoughts. It has been proven now scientifically... an affirmative thought is a hundred times more powerful than a negative thought. I've seen many miracles take place in people's lives... financial miracles, miracles of physical healing, mental healing, healing of relationships. You can begin right now to feel healthy, you can begin to feel prosperous, you can begin to feel the love that's surrounding you, even if it's not there. And what will happen is the Universe will correspond to the nature of your song, the Universe will correspond to the nature of that inner feeling and manifest, because that's the way you feel. You end up attracting to you the pre-dominant thoughts that you are holding in your awareness, whether those thoughts are conscious or whether they're unconscious. I couldn't believe all the people who knew this, they were the greatest people in history: Plato, Shakespeare, Newton, Hugo, Beethoven, Lincoln, Emerson, Edison, Einstein. Out of my greatest despair was to come the greatest gift. Law of attraction says... we'll give you whatever it is you say and focus on, and so if you are complaining about how bad it is, what you're creating is more of how bad it is. Most of us have never allowed ourselves to want what we truly want, because we can't see how it's going to manifest. Our feelings are a feed back mechanism to us, about whether we are on track or not, whether we are on course or off course. Since I learned the Secret and started applying it to my life, my life has truly become magical, I think the kind of life that everybody dreams of, and I live it on a day to day basis. The emotions are this incredible gift that we have to let us know what we are attracting. The law of attraction doesn't care whether you perceive something to be good or bad or whether you don't want it or you do want it, it's responding to your thoughts. The law of attraction says that like attracts like, but we're really talking at the level of thought. The study and practice of the law of attraction is just figuring out what will help you generate the feelings of having it now... Go test drive that car, go shop for that home, get in that house - do whatever you have to do to generate the feelings of having it now, and remember them, whatever you can do to do that will help you to literally attract it. What you focus on with thought and feeling is what you attract into your experience, whether or not it is something you want. When you focus on something with a lot of passion, it makes it happen even faster. Everything that is coming into your life, you are attracting into your life and it is attracted to you by the virtue of the images you are holding in your mind, it's what you're thinking, you see, whatever is going on in your mind, you are attracting to you. Wise people have always known this. If you do just a little research it is going to become evident to you that anyone who ever accomplished anything, did not know how they were going to do it, they only knew that they were going to do it. You don't know how, it will be shown to you, you will attract the way. Life can be absolutely phenomenal and it should be and it will be... when you start using the Secret. Now if you don’t understand it, it doesn’t mean that you should reject it, you don’t understand electricity properly, first of all no one really know what electricity really is, but you enjoy the benefits of it. The Law of Attraction is always working... whether you believe it or understand it or not, it's always working. This secret gives you everything you want: Happiness, Health and Wealth. We all guide ourselves by exactly the same laws. We're all working with One Power, One Law... It's Attraction. What do you really want? Sit down and write it out on a piece of paper, write it in the present tense. You might begin by writing... 'I am so happy and grateful now that...' and then explain how you want your life to be in every area. When your feeling down, do you know you can change it, like that... Put on a beautiful piece of music, start singing, that will change your emotion - or think of something beautiful, think of a baby, maybe one you love, really keep that thought in your mind, block out everything but that thought. I guarantee you'll start to feel good. You will attract everything that you require. If it's money you need... you'll attract it. If it's people you need... you'll attract it. If it's a certain book you need... you'll attract it. You've got to pay attention to what you're attracted to because as you hold images of what you want, you're gonna be attracted to things that are going to be attracted to you, but it literally moves into physical reality with and through you.. and it does that by law. This principle applies to your family pet, for instance, which I believe are wonderful because they put you into a great emotional state. When you feel love for your pet, that's a great state of love that's going to bring goodness into your life, what a gift that is. It's really important that you feel good, because feeling good is what goes out as a signal into the Universe and starts to attract more of itself to you. So the more you can feel good, the more you will attract the things that help you feel good and keep bringing you higher and higher. See yourself living in abundance and you will attract it. It always works, it works every time, with every person. You want to become aware of your thoughts, you want to choose your thoughts carefully and you want to have fun with this because you are the masterpiece of your own life, you are the Michelangelo of your own life, the David that you are sculpting is you, and you do it with your thoughts. I am not talking to you from the point of view of just wishful thinking, or imaginary craziness. I'm talking to you from a deeper basic understanding - quantum physics really begins to point to this discovery, it says that you can't have a Universe without mind entering into it, the mind is actually shaping the very thing that is being perceived. 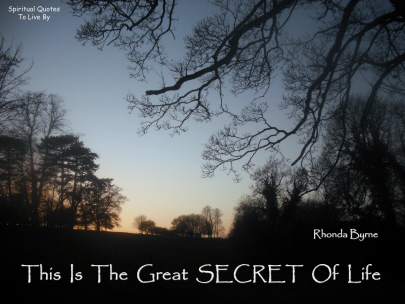 Check out The official website of The Secret for more information on The Secret movie and book, along with other books written by Rhonda Byrne.